Renovated to perfection, this sophisticated garrison colonial will exceed all of your expectations. Thoughtful updates were done throughout the house creating the perfect palette for the next owner. Stylish and chic design is showcased from start to finish including a Calcutta marble feature wall in a herringbone pattern, board and batten wall and a sliding barn door in the master bedroom, crown molding and wainscoting and impressive counter and tile finishes. The renovated chef's kitchen beautifully transitions to both the family room with gas fireplace and marble surround and the elegant dining room creating wonderful open entertainment spaces. Lower level is full of surprises with a custom playhouse, craft room, full bathroom and stunning office with custom built-ins. Come share in the excitement of this property, it will be love at first sight. 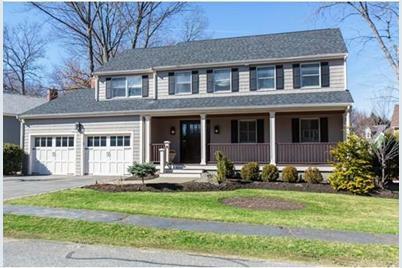 15 Canavan Cir, Needham, MA 02492 (MLS# 71972912) is a Single Family property that was sold at $1,226,000 on June 08, 2016. Want to learn more about 15 Canavan Cir? Do you have questions about finding other Single Family real estate for sale in Needham? You can browse all Needham real estate or contact a Coldwell Banker agent to request more information.